BRACING YOUR TEAM FOR BAD WEATHER - The Rough Notes Company Inc. This year has already had its share of bad weather, including heavy rains, floods, strong winds and fires. Winter is coming, and for many parts of the country it means harsher weather is heading our way. Bad weather conditions impact employee productivity in so many ways, from commuting hazard, and school closures creating childcare issues to power outages and property damage. 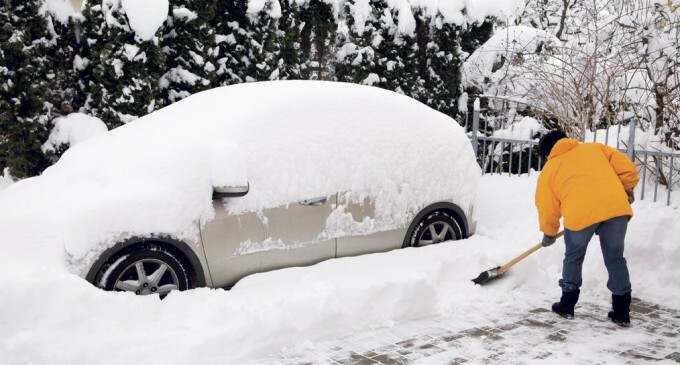 Closing workplaces due to bad weather and dealing with employee productivity and pay issues create additional business expenses and demand management attention. Ensuring that your business has a well-thought-out and communicated inclement weather plan can provide some shelter for both your employees and your business. It also enables you to stay ahead of the practical employee relations, wage and hour, and safety issues that arise during a weather crisis or natural disaster. Your overall inclement weather plan should consider all of the variables relating to business disruption, including the definition of what constitutes inclement weather, safety considerations for both employees and your facilities, designation of authorized personnel who will determine whether the business will close or have a delayed opening or early closing, how resulting work responsibilities will be handled, and employee notification and reporting procedures. Be sure to have multiple methods for employee notification in case of power failures. Your plan should also consider employee issues as a result of bad weather. For example, even if the business doesn’t close (or is open and staffed only with essential personnel), schools and daycare facilities may be closed. You need to consider your policies for allowing employees to work remotely from home or bring their children to work. You should also determine if you will allow nonexempt employees to make up work for the missed time. Employee communications should be as comprehensive as possible regarding business operations, reporting procedures and pay issues. How will I be notified if I am expected to come in to work? Can I work from home or a closer company location? If schools/daycares are closed, can I bring my children to work or work from home to take care of them? What should I do if I’m told I need to be at work and the public transportation I take to get to work is not operating? Or my car won’t start? Or the roads are unsafe for driving? Will this absence count against our attendance policy? If I cannot work due to bad weather, will I be paid for the time off? Will my vacation or paid time off (PTO) balance be charged for the time missed? How do I report my time? Workforce planning: If there will be a need to operate with a reduced workforce during inclement weather conditions, determine staffing needs for essential and non-essential personnel and establish preliminary work schedules. Weigh the risks of business disruption with potential risks for negligent liability if employees are involved in accidents at work caused by the harsh conditions. Check your liability insurance for coverage for these potential events. Communications: Identify who is responsible for announcing closures and how that information will be communicated to all employees. Have multiple methods for communication and consider methods for communication when the power is out or phone lines are down. Get creative—use social media and other forms of electronic communication as well as traditional methods. Let employees know who the key decision-makers are and how to check in and/or communicate before you need to communicate. As a best practice, remind employees of your communications and office-closure policies when severe weather is forecasted, even if you don’t need to use those policies. Employee relations: Determine how you will handle the childcare question, working from home or other closer-to-home company locations, and other employee considerations that may impact your business. Be sure to specify in your inclement weather policy who can work from home, when they can do it, how they should report what work they are doing, and how they should record the time they spend working remotely. You should also address general remote work requirements that are part of your existing telecommuting policy. Be sure to communicate your company position relative to these policies and be consistent in the application ofyour rules. Pay: This is a critical issue for your employees, especially during this time when they may be facing additional personal expenses as a result of the weather. Make sure that your management team is fully aware of the company’s pay obligations under state and federal laws and regulations, as well as the company’s policies for managing those rules, and also make sure that they can address the issues when their employees ask about them. The Fair Labor Standards Act (FLSA) covers compensation for partial- (or full-) day absences that are outside of both the employer’s and the employee’s control due to weather or other natural disasters. Many states have laws covering this issue, as well, so be sure to check your state pay rules. The law treats overtime nonexempt hourly employees differently from exempt employees when it comes to pay for time not worked. What follow are the rules you need to know when developing your inclement weather pay practice. Please note that employers may provide richer compensation programs than the FLSA or state law requires. Under the FLSA, employers are not required to pay nonexempt hourly employees if those employees perform no work, either for full or partial days. This is true for most partial day closures, such as when employees report for work and then are told that there is no work for them. In addition, the FLSA does not require an employer to “keep” employees working for any specific number of hours or pay them for hours they were assigned to work, but didn’t. Laws vary from state to state, and currently eight states— including California, Connecticut, Massachusetts, New Hampshire, New Jersey, New York, Oregon and Rhode Island—plus the District of Columbia have additional reporting-time pay rules that impact adults and/or minors. But even in states where additional reporting-time pay is not a requirement, many employers do pay something, such as a minimum of two hours’ pay for time not worked when bad weather forces an early closing. However, if the company is being kept open and employees are voluntarily allowed to leave early, these employees are usually not paid for the time off. The rules for exempt employees are more difficult, because the FLSA provides that employees classified as exempt are paid for the jobs they do on a “salary basis,” not the hours they work. Under the FLSA, exempt employees should be paid their full salary for any work performed in that workweek. Even though the FLSA does not require employers to provide any type of paid time off (vacation, personal time, sick leave, or holidays) to any workers, if the employer does have those programs, then the employer may substitute any paid time off (PTO) as a deduction from the exempt employee’s PTO bank to cover the pay for the time not worked due to the facility closure, even if it is less than a full day, without affecting the salary basis of payment. This is true as long as the employee still receives a paycheck equal to the employee’s guaranteed salary. The balance in the bank is already negative. Further, if the company remains open during the bad weather and an exempt employee is absent for one or more full days for personal reasons (transportation issues, weather-related housing or child care, etc. ), then the salaried status will not be affected if deductions are made from the employee’s salary for such absences.